Comments: E. PARALEA COLBERT (Nee: WEATHERS) | BlackOak ARKANSAS United States | | Comments: THIS IS THE HEADSTONE OF E.P. WEATHERS-FORD-COLBERT OF BLACKOAK ARKANSAS. ALSO KNOWN AS LEAH WEATHERSOR LEE WEATHERS..SHE WAS BORN IN TENNESSEE, DAUGHTER OF JAMES AND LUCINDA WEATHERS. SHE MARRIED A MR. FORD, HAD 2 KIDS BY HIM (NORA FORD AND JAMES WILLIAM (WILL) FORD). 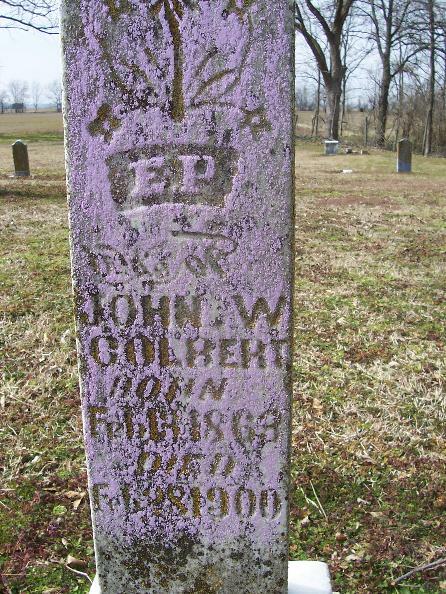 LATER SHE MARRIED JOHN W. COLBERT AND HAD 2 CHILDREN WITH HIM (THOMAS J. COLBERT AND BERTHA COLBERT) THOMAS J. IS BURRIED TO THE LEFT OF HER AS HE DIED SOON AFTER HER AND WAS ONLY A SMALL CHILD.